One of the things I love about Passover, is that as part of the holiday, you read about the origin and tradition. When I celebrate things, I want to know why. So, sitting at my dad’s house Christmas morning, I wanted to know more about Christmas. What I already knew is that Christmas celebrates the birth of Jesus (even though it isn’t really his birthday) and that the timing was chosen because it corresponded with other “pagan” celebrations around the solstice. 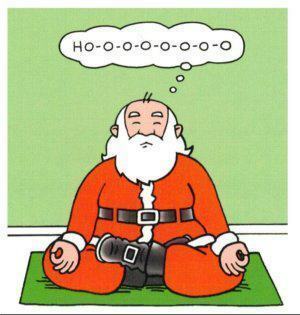 So you might say, that in celebrating Christmas, we are all, in a sense, engaging in some form of ancient yoga!